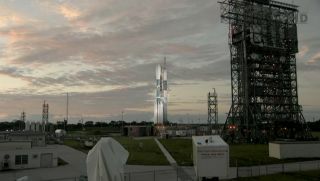 Dawn breaks over Florida's Cape Canaveral Air Force Station as an unmanned Delta 2 rocket stands poised to launch NASA's twin Grail lunar gravity probes toward the moon on Sept. 8, 2011. NASA is preparing to launch a pair of moon probes Thursday morning (Sept. 8) on a mission to study the moon's gravity in unprecedented detail, but the agency is keeping a close eye on iffy weather that could thwart the scheduled liftoff. The space agency's twin Grail spacecraft, which are designed to map the moon's gravitational field, are set to launch at 8:37 a.m. EDT (1237 GMT) from the Cape Canaveral Air Force Station in Florida, with a second opportunity available at 9:16 a.m. EDT (1316 GMT). An unmanned Delta 2 rocket will carry the lunar twins into space. If Thursday's launch is delayed, the forecast is not much better Friday, Joel Tumbiolo, Grail's launch weather officer from the Air Force's 45th Weather Squadron, told reporters in a news briefing Tuesday (Sept. 6). Better conditions are expected over the weekend, he added. NASA has a 42-day window to launch the Grail spacecraft that extends through Oct. 19, agency officials said. The $496 million Grail mission (which is short for Gravity Recovery And Interior Laboratory) is a three-month expedition to measure the moon's gravitational field like never before. The mission is expected to help scientists better understand the composition and evolutionary history of Earth's natural satellite. The two spacecraft, called Grail-A and Grail-B, will enter into tandem orbits around the moon, about 34 miles (55 kilometers) above the surface. The probes are expected to arrive at the moon around New Year's Day, after taking an energy-efficient path to the moon, the researchers said. The probes will circle the moon about 75 to 225 miles (121 to 362 km) apart from one another, and instruments onboard the two spacecraft will keep precise measurements of the distance between them, said Sami Asmar, Grail deputy project scientist at NASA's Jet Propulsion Laboratory in Pasadena, Calif.
As the probes fly around the moon, regional differences in the lunar gravitational field will cause the spacecraft to speed up or slow down, altering the distance between Grail-A and Grail-B. The twin satellites will use microwave signals to communicate with one another and measure this distance to within less than the width of a human red blood cell, Asmar said. Mapping the moon's gravity field and probing the lunar interior to investigate its composition will also help scientists better understand how the rocky body formed 4.6 billion years ago and the moon's evolutionary history. This will help provide clues about how other large objects in the inner solar system came to be. The Grail spacecraft also carry a set of cameras that will snap views of the moon for students on Earth. The cameras are the core of the MoonKam project to encourage middle school students to pursue studies in math and science. The effort is being led by former NASA astronaut Sally Ride and her company Sally Ride Science. NASA has also reached out to the public using social media to spur interest in the Grail mission. The space agency invited 150 of its dedicated Twitter fans to watch Thursday's moonshot in person and relate their launch experience to the public. "The moon is a fantastic body […] in terms of learning about early planets," Zuber said. "It's nearby, it's accessible, and it preserves the record of what early planets are like. Other planets in the inner part of the solar system have gone through the same processes that the moon has gone through. I think in the next five years, we're going to rewrite the book on our understanding." Detailed lunar gravity maps could also facilitate the planning of future robotic or human exploration missions to the moon or beyond, said Richard Fogel, Grail program scientist at NASA Headquarters in Washington, D.C. Data from Grail will help scientists accurately zero in on potential landing sites and could help future spacecraft arrive there safely and efficiently. Plus, it's important to understand nearby cosmic bodies, he added. "The moon is your backyard," Fogel said. "If you have a house, the moon is the house next door. Mars would be miles away. It pays to understand your nearest neighbor."